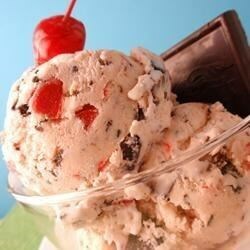 "Deliciously creamy homemade ice cream is combined with chocolate chunks and maraschino cherries. Though not an exact replica of an ice cream flavor that you may have seen in the store, this frozen dessert is sinfully rich!" Stir together cream, milk, sugar, and the juice from the jar of cherries in a large saucepan over medium heat. Bring to a simmer, then remove from heat. Place the egg yolks into a large bowl, then whisk in hot cream, about 2 tablespoons at a time, until you have added 2 cups. Whisk the hot yolks into the saucepan of hot cream, then cook on low, stirring constantly, until the mixture reaches 170 degrees F (75 degrees C). It will have thickened enough to coat the back of a metal spoon. Pour the mixture into a container, cover, and refrigerate until cold, about 6 hours. Chop the reserved maraschino cherries, then stir into the cold custard along with almond extract, and chopped chocolate. Pour into ice cream maker, and freeze according to manufacturer's directions. See how easy it is to make America’s favorite frozen dessert. This makes too much for the typical 1 quart ice cream maker. Be sure to cut down the recipe so you don't have a mess on your hands. Great flavor! I used dark chocolate instead of bittersweet and it still tasted great. Rich, creamy, delicious. I added 2 jars of maraschino cherries and it came out great. Tried this recipe yesterday and loved it!! The only thing I changed was, I used double chocolate (Ghirardelli, yum!) instead of bittersweet chocolate. I wouldn't change anything else!